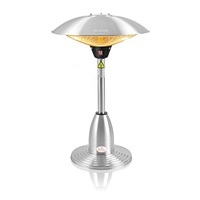 If you’re a bit limited on space in your garden or if you just prefer, a table top patio heater conveniently utilises your garden table by sitting on top of it and providing heat just like a standard patio heater would. The area of heat a table top heater covers may not be as much as the standing patio heater but it is a space saving design that will still be enough to provide enough heat to those sitting around the table. Space saving as it can just simply sit on top of a table or something similar. Light and portable so it can be easily moved to different locations. Quite expensive compared to standing patio heaters. Heat provided covers a smaller area. Due to the light weight, may not be as stable and could be knocked over easier. Wider range of choice in design therefore prices can vary from cheap to expensive. Provides heat to a wide area. Some models has adjustable height which allows you to control if you want more intense heat targeting a smaller area or less intense heat spread over a wider area. Strong, stable and sturdy which makes it less likely to tip over. Quite big so requires more space in the garden. 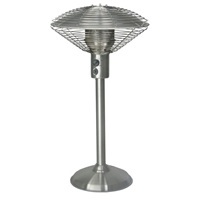 Type – Patio heaters are either powered by gas or electric, each of them will have their pros and cons. We’ve provided a list of their pros and cons which you can read by clicking here. Power output – The power output is the rate at which energy is generated or used. As you can see from the table above gas patio heaters tend to have a much higher power output than electric patio heaters, but that doesn’t mean that a 4kW gas heater provides nearly twice as much heat as a 2.1kW electric heater, it just means more energy is used. A lot of electric patio heaters have different power output settings so you can choose how powerful you want the heat to be. Gas patio heaters are generally more powerful than electric ones but burn a lot more energy therefore making it more expensive to run. Auto cut off tilt switch (applicable to gas only) – If the patio heater is tipped over, this safety feature will cut off the valve to the gas supply. Ignite failure safety (applicable to gas only) – Another safety feature which cuts the gas off if the flame failed to ignite. Regulator and hose (applicable to gas only) – You need a regulator and hose to connect to the gas supply, most gas patio heaters will include this to save you from having to buy it. Although the gas supply will have to be bought separately still. Cable length – Quite self-explanatory but this will only be applicable to electric patio heaters as it will be powered through the mains. Long lasting and highly efficient halogen heating element which can last up to 5000 hours. Can choose from three different heat settings (900W, 1200W or 2100W) depending on how much heat output you want. Provides heat to an area of up to 9m². Get the most out of this heater as it can be used both indoors and outdoors. IP44 approval which suggests it’s a waterproof design. Heating not as effective during windy conditions. 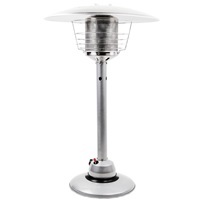 If an energy efficient table top patio heater that can be used all year round is something you’re after then this may be your call. The option to choose from the three heat settings allow you to save energy by using less heat when it’s not needed or keep warmer by using more heat when it’s needed. Runs on a halogen bulb which can last for up to a massive 5000 hours. Conserve energy when you don’t need it and choose from the three adjustable heat settings. Very stylish luxury black rattan base design will go with almost any furniture. Strong and durable extruded aluminium alloy frame. Not very compact as this model is quite tall standing at 106cm. 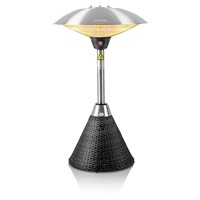 How about an energy efficient tabletop patio heater that’s also very stylish and elegant? This model can really blend in with most garden furniture such as a 2 seater garden bistro set or romantic garden love seat! It’s a bit more expensive than other models, but you get what you pay for. Variable control valve allows you to control the heat output to your liking. Compact size only 88cm tall. UK gas regulator and hose included. Only includes a 1 year warranty whereas the other models in the table include a 2 year warranty. A good option for anyone who’s looking for a cheap gas table top heater, however, the build quality is not the best. It will “do the job” but if you’re after something that can be used year after year, perhaps this is not the best option. Provides good heating with up to 4kW output. Control the heat output according to how cold it is. Safety features such as tilt switch off and ignition failure built-in. Weighted base for extra stability so it’s not as easy to tilt over. Made from high quality durable stainless steel. 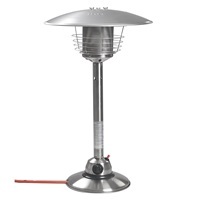 Another sturdy and reliable tabletop patio heater by Firefly, thanks to the durable stainless steel construction this mini patio heater should last for at least a good few years. However, because it runs on gas it can only be used outdoors. Compact but powerful 4kW gas patio heater. Control the heat output to your desired preference. Base is weighted to provide extra stability. The material it’s made from can rust if left outdoors when not in use. If you’re looking for a smaller more compact heater then perhaps this one is not the best option as it’s 96cm tall. Other than that, it would be ideal to have this on your table top as its 4kW output will be enough to keep everyone around the table warm.